A good dish of lasagna is one of the most satisfying meals I can imagine. But, to be honest, a dish of classic lasagna di Carnevale or lasagne alla bolognese can be a bit on the heavy side, especially as the weather gets warmer. That’s the beauty of vegetarian lasagne. If not exactly dietetic, they are lighter than meat-based lasagne and yet totally satisfying. You can make lasagne with almost any vegetable. But perhaps my favorite is Asparagus Lasagna, made with the most elegant and, to my taste, most toothsome of Spring vegetables. The basic technique for making Asparagus Lasagna is the same as for lasagne alla bolognese (see this post for the recipe). But instead of bolognese ragù, a combination of steamed asparagus tips and a purée made from the stalks the essential flavor. Begin by preparing a batch of fresh egg pasta, then a good portion of béchamel sauce. Set aside until needed. Now prepare the asparagus: Trim and peel the asparagus, then boil, or better, steam them in lightly salted water until tender—not crisp tender or mushy, but fully tender. Cut off the tips and set them aside. Purée the remaining stems in a blender or food processor with a bit of béchamel sauce. Season the purée with salt to taste—it should be quite savory. Now assemble your lasagna just as you would classic lasagne: place a layer of parboiled pasta in a buttered baking dish, then a thin layer of béchamel, followed by a layer of asparagus purée, then place a few asparagus tips here and there, then sprinkle generously with grated parmesan cheese. Keep on layering in this way until you have used up your ingredients—or until you have laid down four or five layers of pasta. (This kind of lasagna should not be too thick.) Cover with a layer of béchamel, sprinkle with more grated parmesan and dot with butter. Bake in a hot oven (400F/200C) for about 20 minutes or so, until the top is lightly browned. Allow the dish to settle and cool for 10-15 minutes or more—see below—before serving. The basic technique for Asparagus Lasagna is really quite easy once you get the hang of making the béchamel and fresh pasta. And it can almost be an every-day dish if you use store-bought fresh pasta, although, as I’ve commented before, finding true fresh egg pasta suitable for this kind of lasagna can be a challenge. If you use no-boil lasagna sheets, make sure to make a rather loose béchamel and slather it abundantly over the pasta, as unboiled pasta absorbs a lot of sauce. Another substitution that, however unorthodox, I like better: egg roll wrappers. Yes, egg roll wrappers. While they lack the rich egg flavor of homemade pasta, they have the same fine, silky texture as very fine homemade pasta. And you add them directly to the baking dish, no pre-boiling necessary, saving considerable time and effort. If you want a richer dish, you can sauté the asparagus tips in butter before adding them to the dish. And you can also make the dish even more savory if you like by allowing the asparagus purée to insaporire in a soffritto of butter and shallots before folding in a bit of béchamel. In the alternative, instead of asparagus purée, you can sauté both tips and stems in butter, along with a bit of shallot, and layer them over the béchamel. 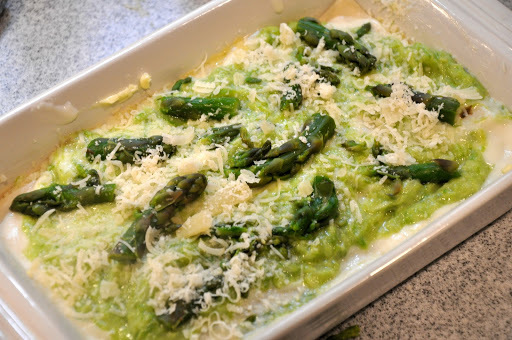 And some versions of asparagus lasagna really go to town, adding bits of soft cheese like a fontina or bel paese, and/or shredded prosciutto along with the asparagus tips. You can make all sorts of vegetable lasagne using the same basic method. For vegetables like mushrooms that don’t purée well, simply slice them thinly and sauté them in butter or oil, along with a bit of shallot or onion or garlic. (The choice of allium depends on the vegetable and the effect you are after). If fact, almost any sauteed contorno can do service to stuff lasagne in this way: funghi trifolati, piselli alla romana… You can even make lasagna with a combination of different vegetables, with a different vegetable between each layer of pasta. There is really no end to the variations you can dream up. And with all that lovely béchamel and butter, they are all delicious! It is very important to let the dish rest for some time before serving. Not only is the pasta scalding hot when it has just come out of the oven, but as the dish cools it also firms up a bit. If you serve asparagus lasagna—or any lasagna—direct from the oven, it will fall apart when you serve it. And the longer you wait, the firmer the dish will be. A 10-15 minute wait is the minimum, but you can let it rest for up to 30 minutes. And don’t worry, it will still be nice and warm. Nota bene: More tips on lasagna-making are included in the post on lasagne alla bolognese. Begin by preparing a batch of fresh egg pasta, then a good portion of béchamel sauce (see Notes for links to the recipes). Now prepare the asparagus: Trim and peel the asparagus, then boil, or better, steam it in lightly salted water until tender—not crisp tender or mushy, but fully tender. Cut off the tips and set them aside, and purée the remaining stems in a blender or food processor with a bit of béchamel sauce. Season the purée with salt to taste—it should be quite savory. Now assemble your lasagna just as you would classic lasagne: place a layer of pasta in a buttered baking dish, then a thin layer of béchamel, followed by a layer of asparagus purée, then place a few asparagus tips here and there, then sprinkle generously with grated parmesan cheese. I made this at the weekend, Frank, and it was absolutely delicious. Thank you so much for sharing the recipe. This must be lasagne week, Frank… you, Valentina, me (this coming Saturday)! I love the asparagus version – I will give it a go soon! I like a béchamel-based lasagne. Looks incredibly yummy! This will be perfect for getting my youngest to eat asparagus. He loves lasagna. I already found a classic lasagna recipe online, but this would be a lovely addition to my collection of recipes. By the way, just wanna make sure. The classic lasagna alla bolognese don’t have eggs in the bechamel sauce, right? Because this is the recipe I found for it (http://blog.nonnabox.com/how-to-make-lasagna/). But in some recipes they put eggs in the bechamel sauce. So I’m wondering which is the original style. I never put eggs in the béchamel—never even heard of it, actually. Just to be sure, I checked some standard Italian cookbooks and none call for it. I don’t think it’s a good idea, since the whole point of the béchamel sauce is to add creaminess to the dish. The egg would to the opposite, and solidify/stiffen the sauce as the lasagna cooks. Those recipes may be confusing this style of lasagna with the southern Italian style, where eggs are often mixed with the ricotta. Anyway, I do hope you guys like this dish if you make it! Another winner. Grazie Frank! I appreciated your tips and variation suggestions. They came in handy! I always follow a new recipe exactly but I was not at home when I made this and so needed to follow some of your variations. I couldn’t make the pasta, and the little grocery store only had no-boil lasagne. My first time cooking with them, and probably my last. I see why you suggested the wrappers. The tip for a looser sauce for them was very helpful. You had me at “one less pot to clean” in the Béchamel recipe. I tried your suggestion to sauté the asparagus, cut thinly on the bias, with a tiny clove of thinly sliced garlic (all we had) in butter. Removed them to a bowl and used the same pan to make the Béchamel, which came out perfectly smooth (and a faintly pale green from the residual butter) using room temperature milk and a lot of whisking. We didn’t have a blender or food processor, so the asparagus was layered in as is. When I am home I will purée as the original recipe calls for – I get what you are doing with the Béchamel and asparagus sauces being layered like you would with Bolognese in a traditional lasagna and there would be more of an asparagus flavor throughout. But even with all of the changes to make do with what I had it was easy, beautiful, delicate and delicious. Definitely going in the rotation. Grazie mille! Thank you, Teresa, for your kind comment. It sounds like you’ve really made this recipe your own, which is just what I was hoping my readers would do. Enjoy! The dish looks fantastic Frank! Fun fact: Greece produces lots of asparagus and exports almost 100% of them:) For some strange reason, these yummy veggies don’t play any important part in modern Greek cuisine. You recipe is definitely an incentive to give them another try ourselves:) The dish looks rich and filling and using your advice we bet it’ll taste amazing! Thank you for the delicious idea! Funny asparagus isn’t better appreciated there, it’s such a delicious vegetable… Thanks for your comment, guys! Looks absolutely D E L I C I O U S. I will try it for to night’s dinner. I just love everything Italian….having been there and am dying to go back. Food means Italian and Italian means food. Hope you like it, Heather! Dear Frank … every single post you write and bring to us is worthy of utmost attention and appreciation. You invite us to try something, every single time, and you give us some very good instructions and tips. You keep traditions alive. I love that about all your recipes. Thank you! I don’t actually like green asparagus, but this still looks sooo good! I’m making regular lasagna right now, but have got to make a white one soon. I tried one from an Italian restaurant here in LA last October and have been dreaming about it since! Love a meat-based lasagna, but veggies ones are more sensible. Particularly, as you point out, when the weather gets warmer! This looks terrific — really good stuff. Thanks! And thank you for your comment, John! Have made a few of your recipes, some over and over. Especially your version of Cioppino, which is really a SF version of a fish dish from Liguria. We have it with your recipe for ‘Aglio, olio e peperoncino,’ which I make with bucatini. I’m planning to cook your Asparagus Lasagna next. You have created a wonderful site which I follow with pleasure. Have made a few of your recipes, some over and over. Especially your version of Cioppino, which is really a SF version of a fish dish from Liguria. We have it with your recipe for ‘Aglio, olio e peperoncino,’ which I make with bucatini. Just in time, my vegetarian daughter is home for spring break! I especially like how the asparagus is incorporated into the béchamel, prominantly feature the flavor of this iconic spring vegetable. Glad the timing was so propitious… ! And thank you for your comment, Linda. A simply beautiful dish and really quite simple. But there isn’t anything simple about the wonderful ingredients. I’ve never made an asparagus lasagna but I’m about to. Can’t wait to make this it’s a love springtime welcoming dish. Buon fine settimana, Frank. Hope you enjoy it, Marisa Franca. Happy cooking! Third comment, and last I promise, to this post… just to let you know I posted about your lovely lasagne and linked back to you! Thanks so very much for the shout out, Fiona! I ended up making these the other evening for a dinner party and they were delicious! Thank you for the inspiration and have a great week end. This is a wonderful variation on spring vegetable lasagne. It also had us thinking Easter! With asparagus! Not spinach! Oh this sings to my wishing-for-spring-loving-heart. On my agenda. Easter? Sounds fine to me. :=) If you do decide to serve it for Easter, please let us know how your family likes it! Such an inspiration, this blog is. I had no idea asparagus lasagna existed — I must taste it! Asparagus is also one of my favourite springtime vegetables. Thanks for sharing, Frank! And thanks for stopping by, Nancy! You’re welcome, Nancy! Thanks so much for stopping by! This looks wonderful, I think it’s going to be the 1st course for my Easter dinner. One question, can a lasagna like this be assembled the day before and baked the next day, or would it be better to bake in advance and re-heat? Or is neither a good option. That’s great, Steve! Do let us know how it turns out. A robust lasagna like Angelina’s lasagna di carnevale can be made ahead and re-heated—it’s even better that way. But, if you ask me, a delicate lasagna “bianca” like this one would suffer. Called “bianca” because there’s no ragù involved, as you can see, this kind of lasagna is basically just pasta baked with a béchamel sauce, flavored with a veg. If you’re cooking a major dinner and won’t have time to fuss at the last minute, I could see assembling the dish a few hours ahead of time, say in the morning for dinner, and baking it when you’re ready to eat. The thing to bear in mind when assembling a lasagna ahead is that the partially cooked pasta will tend to absorb the sauce over time as it sits, so use more sauce than you would otherwise or the lasagna will tend to turn out dry. That’s doubly true for a lasagna that is baked. It tends to ‘stiffen’ over time—that’s a good thing to a point, which is why you should always let lasagna rest for a few minutes before serving, so you can slice it—but only to a point. I’ve tried to reheat leftover lasagna in bianco the day after and, while it’s still edible of course, it’s as solid as a brick. And that robs you of one of the big pleasures of this dish, its creaminess. Frank, thanks for the tips, all points taken! I know I can make the pasta the day before and freeze, but I’ll make everything else same day. BTW, your recipe doesn’t mention cooking the pasta before assembling, but from making many traditional lasagnas I’m assuming I’ll still boil them. Right, yes, the pasta needs to be parboiled (unless you’re using no-cook pasta sheets. I’ve corrected the text—thanks for the catch. This looks spiffing, just spiffing! Good enough to eat (the photo on the screen I mean!!) … Bravo, another capolavoro! @Robert: Your lasagna looks great. As noted you can really use just about any vegetable. The other day I made lasagne bianche with pipián (a zucchini-like Mexican vegetable) and tomato. More on the cool weather side, you can make lasagna with mushrooms, of course, or radicchio or or fennel or leeks or winter squashes or artichokes… the sky's the limit. Wow – should I have been MORE generous with the pats of butter? Any thoughts on what other vegetables would be good now that fall/winter are on the way? Asparagus Lasagna is one of my favorites! What a healthy recipe! This is something I want my kids to eat! Thanks for this! its great to try new things. when they don't work, you know never to use them again..but if they do, it's like giving your taste buds a new girlfriend! We made this wonderful dish last night, using egg roll wrappers (great idea!!) For four people, we used one bundle of asparagus. Next time, we'll use even more asparagus. Thanks, Frank, for another GREAT suggestion. my girlfriend cooked me up a real nice lasagna the other day. i wishhh she had put in some spinach to make it look like the picture. it was still good dont get me wrong, but i would love to try this. Great posts!! What other vegetables are recommended for lasagna that are good?…any suggestions? FRANK! You have made my day, seriously, I have been looking for a healthier lasagna recipe. And youdunnit! wow, I've never had asparagus lasagna. This dish looks like the very soul of Spring! This is the second time I see egg roll wrappers mentioned as a substitute for pasta and this time you have convinced me to give it a go! I have never seen this version of lasagne before and I love it! another thanks for this evening! I feel like I am going to come back frequently here; my great grandmother was from Trieste, and so my dad, aunt and grandmother lived with her and all speak fluent Italian (lucky them!) and adore pasta, fresh of course! I love the use of asparagus in this lasagna. This just looks so amazing. I cook a lot of Italian dishes and I am finding so much inspiration here. I wish I could just dig into that asparagus. Gorgeous dish! 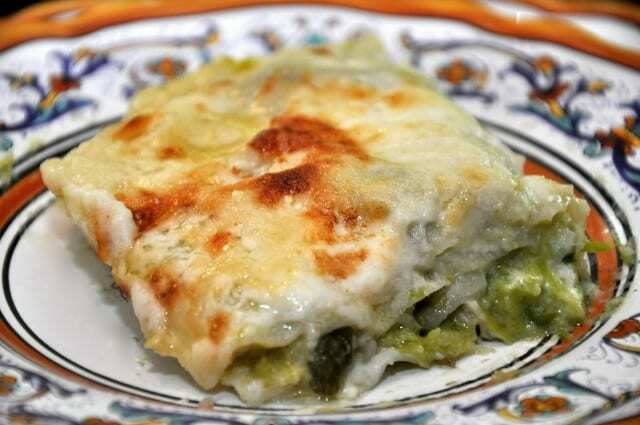 I love lasagne in bianco with asparagus! my mom adds sausage and carciofi and it's one of my favorite dishes, I bet you had a delighful Sunday! I love this idea with the asparagus puree – have got to try this one while it's asparagus season. now that is a spectacular lasagna….great presentation, and I am sure incredible flavours! We love asparagus and lasagna in my house. It's also my husbands favorite vegetable, so I think he'll love your recipe. Sounds like a perfect Spring dinner. Lots of cheese but great use of the in-season veggies! Yum!